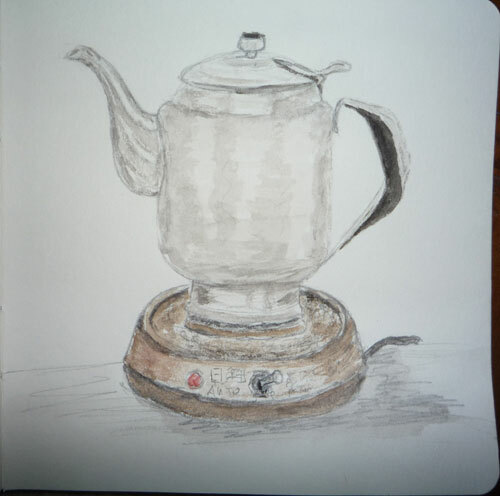 I had to say goodbye to my faithful electric kettle after it gave me a rather nasty shock. I've had the kettle for over 15 years and used it daily to support my infamous tea addiction. I even took it on vacations to have 'real' tea in hotels (boiling water in the hotel coffee pots just makes tea that tastes like coffee, yuck!!.) It worked overtime when the children borrowed it to make instant oatmeal and noodles. I ordered a replacement from The Imperial Tea Court in San Fransisco and it just arrived. It is a little different than the old version but all the important things are the same- stainless steel, quick boil, true pour spout, and most important I can gauge what type of boil the water is at by the sound of the lid jiggling. Easy to get water that is barely fisheyeing for green teas or full boil for black teas. I can't figure out how to get a good scan of this entry from my Handbook journal. I have an old flatbed Microtek Scanmaker 6000. I've tried playing with the settings but I can't get light greys to show up very well. I've had this problem over and over with trying to scan pencil drawings. Any suggestions?? What a great appliance – haven’t seen one like that over here. Sad to lose a long-time friend like this – but nice to find a new one. Hope the new friendship lasts as long as the old one! Phyllis- I’ll try tweaking in Photoshop, it has to be better than my scanner controls. Margaret-The only place I’ve seen this kettle is on The Imperial Tea Court’s website. Nancy- It’s nice to know I’m not the only one to forget the kettle. While I was waiting for my replacement to arrive I boiled a kettle dry on the stove, I didn’t realize what was going on till the smell hit me. I’ll count myself lucky it didn’t explode! I obviously love this type of electric kettle and can’t recommend it highly enough.